Much like setting up a shared folder on a Linux host and a Windows guest, you need to create the folder to share on your host system and add it to your shared folders list in Virtualbox. 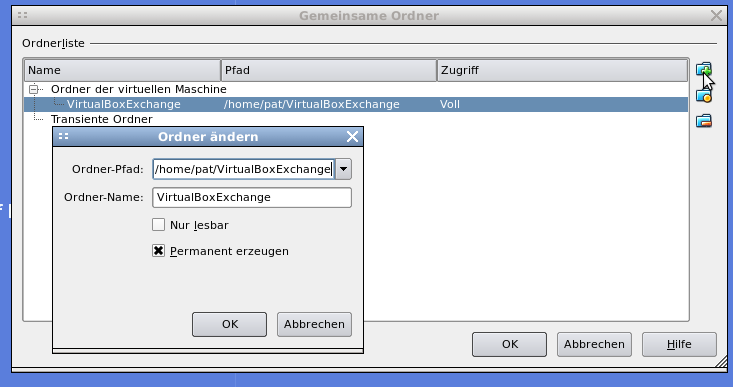 You also need a mountpoint inside your virtual system (in this case: /mnt/VirtualBoxExchange). Dieser Beitrag wurde am 28. April 2010 von pat in HowTo veröffentlicht. Schlagworte: lang:en, linux, Snippets, Virtual Box. 1. Create the folder on your host you like to share with the virtual machine (e.g. /home/pat/VirtualBoxExchange). 2. Add the shared folder to your virtual machine. Dieser Beitrag wurde am 15. April 2010 von pat in HowTo veröffentlicht. Schlagworte: lang:en, linux, Snippets, Virtual Box.